Calendar time or circle time is a great way to start the day in preschool at home. It also allows for some repetition that is necessary for preschool age children. This is a time for learning big concepts in little bites. Preschool at home was a great experience for my daughter and me. I really enjoyed the extra time we had together and since I was a teacher before having kids, it was fun for me to teach my own child. I don’t think you need a teaching degree to do any of this, so don’t be intimidated. 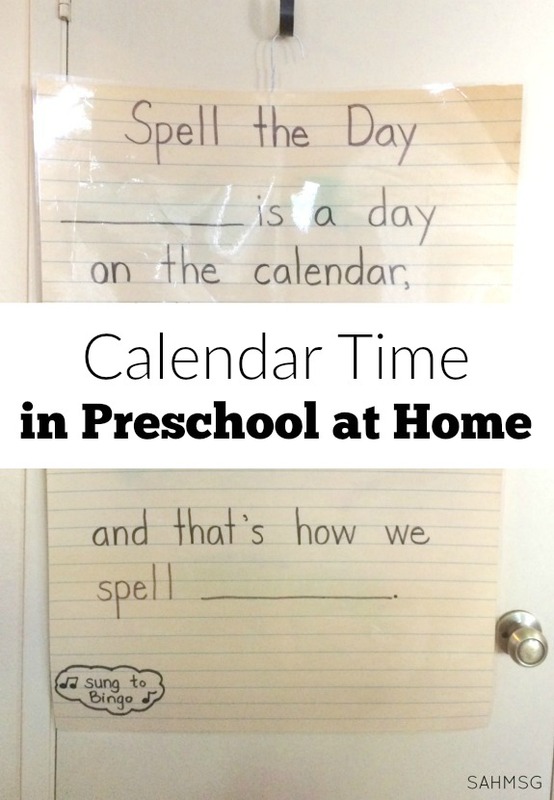 Calendar time is a way to start your preschool day at home with a schedule and introduce reading and writing skills by modeling and learning together. What I used for our calendar time in preschool at home was a basic fill-in-the blank calendar song that I saved from my teaching days. I knew I held onto this for a reason! You can create this on a large piece of poster board, or on a simple piece of 8 1/2 x 11 paper. 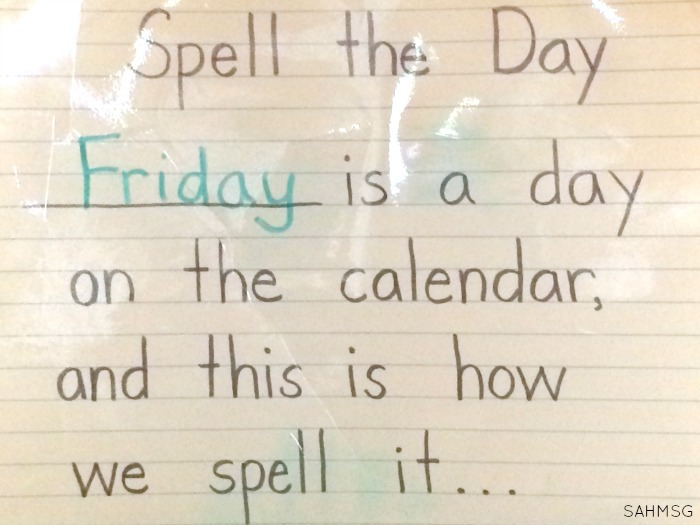 I recommend laminating it so you can use a dry erase marker each day to fill in the blanks. 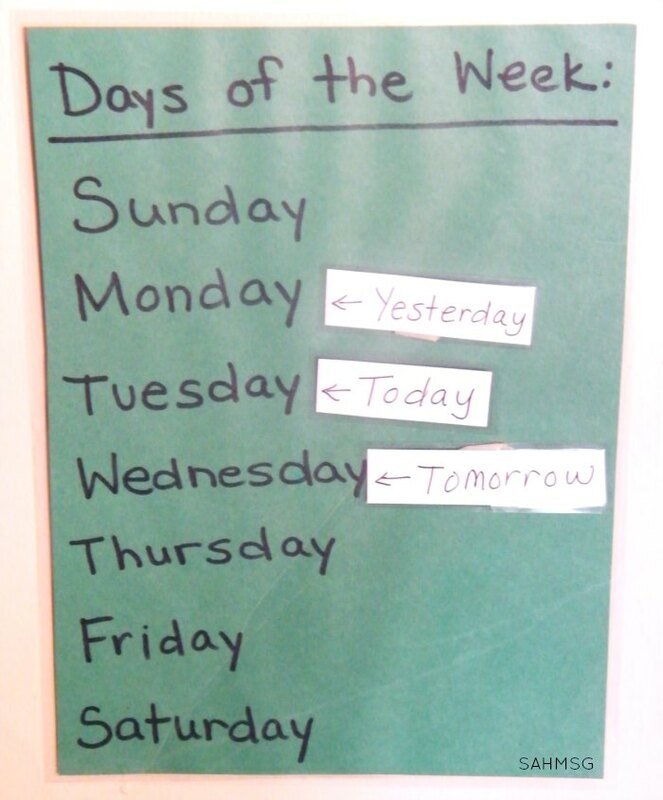 Another piece of our calendar time was a simple poster made on construction paper listing the days of the week in order. I cut out 3 small pieces of cardstock and wrote “yesterday” on one, “today” on another and “tomorrow” on the last. To find out what day it was we would move the pieces of cardstock each day to determine which day we needed to write on our calendar song poster. Some days I would spell the word out loud as I wrote it on the poster. 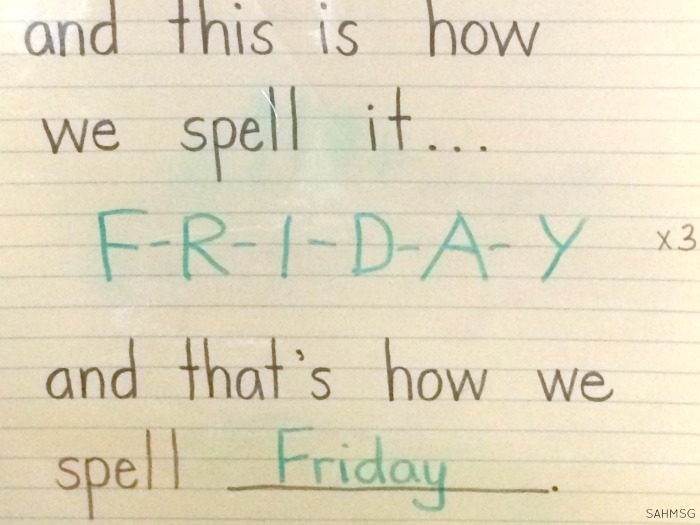 Other days, I would have my daughter tell me what letters to write to spell the word. Bits of our calendar time varied like this to keep things interesting. 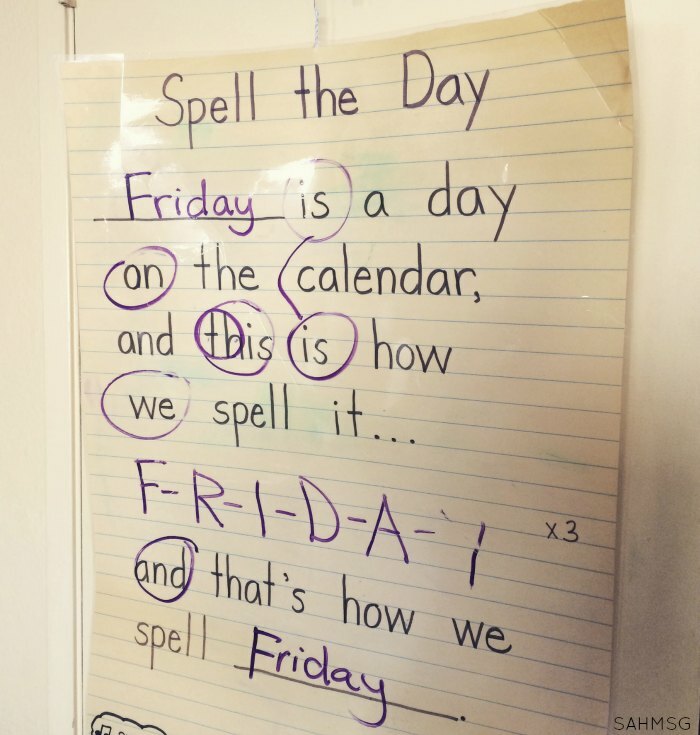 After singing the days of the week in order, and writing the day on the calendar song poster, we would sing the calendar song while I pointed to each word. This is shared reading, spelling and word work in preschool! These kids can learn so much. 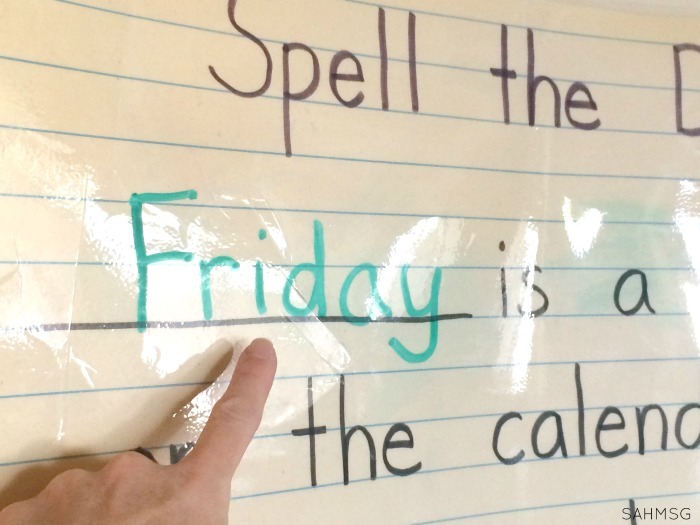 A few weeks into our preschool at home year, I started pointing out sight words, and asking my daughter to point them out too. I would ask her to read the words she knew, and I’d circle them. When we sang the song, I would stop at those words so she could sing them alone. There are so many calendar time and circle time shared reading ideas. 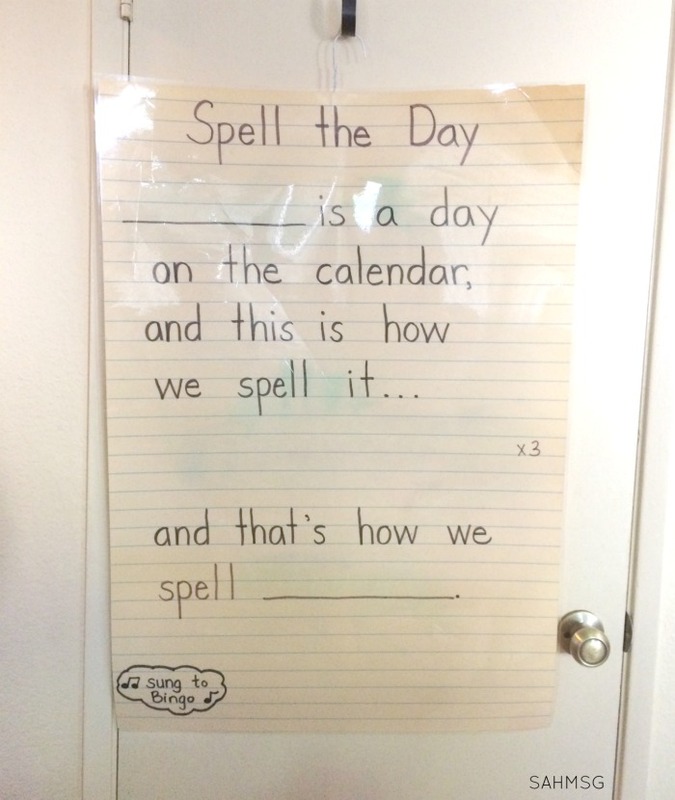 You can write out a poem on poster board and say that together after calendar time. You can sing a song or do a fingerplay. We would generally repeat the poem we read for a few weeks in a row so that the repetition would help with reading skills. View more about our curriculum for preschool at home. How did you start your preschool at home day? Did you do a calendar time? Thank you for these ideas. Is there an age that is too early to start?